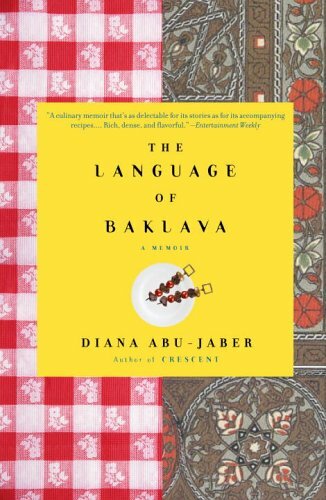 This month we discussed The Language Baklava by Diana Abu-Jaber. Most of us found the book fairly enjoyable, though a few folks couldn't get into it. What we loved best about it was how it wove together the themes of food and family. We discussed how much we loved Bud's complicated relationship with his family, which lead to a very animated discussion about our own families, and the food we share. Foods that have powerful connections to our childhoods included coddled eggs, grandma's egg sandwich, bread pudding, kielbasa, homemade spaghetti sauce, and piroshki. This also brought up the quote "Everyone's mom makes the best potato salad". Humor also played a good part in this book, and we talked about how food and humor go together...and that really both of them are things that make family bearable. Which is part of why we felt Bud's rich uncle was so appalling. Greedy and miserly, there was no humor (and very little food) to be found in that house. Some of our other favorite parts of the book were the trip with her grandmother to the Chinese restaurant (though it was painfully mortifying to read) and the chapter where she moved to Jordan as a child...striking in how easy it was for her, but so sad for the young British boy. We had quite the feast this week. Overall healthier than our usual fair, until you count the fabulous cookie exchange we had at the end! Next month's book is Midnight at the Dragon Café by Judy Fong Bates. Here you can find a little information about the book's background. Here is an author interview. There are currently 4 copies behind the desk at the Mountlake Terrace Library waiting for Foodie Book Group members. We will be meeting on Wednesday January 9th at 6:30pm.